Contains 13% EDL2 and 5% castor plus SPECIAL ADDITIVES to enable EASY STARTING with pullstart engines. Methanol - (CH3OH) 99.85% pure. Produced to BSENISO 9002 standard and IMPCA spec and contains less than 0.05% water. NitroMethane - (CH3NO2) 99.95% pure. The best commercially available spec. Does not contain the carcinogen 2-Nitropropane. Anti-foaming - An Anti-Foaming agent is added to fuels. 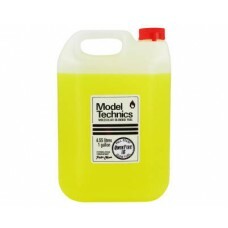 EDL - A synthetic oil developed by Model Technics in 1980 and still under continuous development. Considered to be at the front of synthetic oil technology. Filtration - After mixing fuels are pressure filtered to 1 micron. Castor Oil - (Ricinoleic acid to chemists) Each batch is tested by Model Technics before acceptance. As castor oil is a natural product there are always variations. Klotz Oils - The leading producer of model engine oils in USA. Super Techniplate contains 20% Castor oil while Regular Techniplate is a pure synthetic. ML70 - Produced by G-Max in England, formulated in the early 70s. Iso Propyl Nitrate - Ignition improver for diesel fuels. In world-wide short supply. A must for diesel fuels. Safety - Legal child resistant closures are fitted to all polys.